I just seem to be full of snark these days, don’t I? These two crossed my path and I found myself unable to resist them! I am working on a more serious piece at the moment, but these two little snippets gave me an interlude of mirth, and so I had to share them with you all! Abby Huntsman is a general assignment reporter for Fox News Channel. She currently co-hosts Fox & Friends Weekend. In addition, Ms. Huntsman is the daughter of US ambassador to Russia and former Republican presidential hopeful Jon Huntsman. The word, once spoken, can never be unspoken, and once heard, can never be unheard. This word was heard ‘round the world, and when I read it on The Guardian, I literally let out a WHOOP!!! GOTCHA!!! Yeah, right, sweet cheeks! And by the way … I have a beautiful bridge in Brooklyn for sale real cheap! Quite by accident I stumbled across this little gem on Amazon this morning. Yes, folks, it is a deck of playing cards featuring such utterly deplorables as Kellyanne Conway, Ivanka, Jeff Sessions, Jared Kushner, Sean Hannity, and of course, that #1 deplorable, Donald Trump himself! At only $9.99, this is a must have! I am considering ordering a case and giving a pack to all my friends! Sold by A Patriotic LLC and Fulfilled by Amazon. Gift-wrap available. Well, back to work for me … I hope you enjoyed these two little gems! Have a great day! This entry was tagged #TwoDictators, Abby Huntsman, Amazon, Anthony Scaramucci, deplorables playing cards, Donald Trump, faux pas?, Fox News, Kim Jong-Un. Bookmark the permalink. Thanks Jill! 😃…..(pause for award ceremonies type speech)….Y’know I couldn’t do it without those wonderful wackos who make writing this stuff so easy. They might at this moment being looking for a suitable bus to throw her under 🚌? This is going to be a problem for those republicans who did not support the current administration and its supporters. They are tainted with the same brush, despite what they may say or do. Which has morphed over the years into ‘By Their Deeds You Shall Know Them,’ . Our world grows more difficult by the day. In these fractious times we are all being slowly herded into our tribes and the gaps are growing worse. There are folk making heroic efforts to bridge the divides https://www.bbc.co.uk/news/av/stories-43814097/the-peace-talks-with-a-difference. Methinks that I have no tribe, Roger … I am just a lone wolf 🐺. But thank you for that link!!! That is awesome, and our world leaders could take lessons from this group! But what about us Mom? 🙀🙀🙀🙀🙀🙀🙀? A gaffe, or maybe honest reporting. One wonders, is this history in the making or is it already history? The playing cards portray the things that nightmares are made of, except these boogeymen are real! Your Snarky Snippets are sublime! Thank-you! If Abby Huntsman is truly her Father’s daughter, her slip of the tongue was reflective of what she was thinking but shouldn’t have said. Her Dad as a republican is about the opposite of President Trump as is possible. He is well read, well educated, well-mannered, multi-lingual, etc. 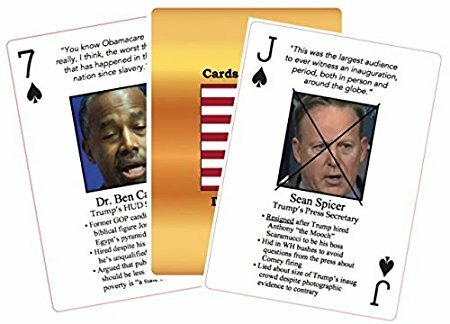 I think the card set makes a great gift. I think I’ll buy it for my son for Fathers Day. My best guess would be that she does consider Trump to be acting like a dictator … was it a slip of the tongue, or perhaps intentional? I don’t recall much about her father, only that he was in the early running for the GOP nomination in 2012. Great idea to buy your son the cards … he isn’t a Trump supporter, is he? I’m considering sending Trump a deck of the cards, too 😉 Hugs!!! Trump is a “ wanna- be dictator”!!!!! Yes, I started out early in his campaign referring to him as “the man who would be king”. I’ve seen nothing to change my mind. Sigh. Quite so. I’m guessing that is how she views him, too. Yes, that would make sense, more than just subconscious. Oh my gosh the cards take me back to the old comedy political protesters! Great! I just saw Dr Rex reposted and I had to come over and enjoy it with you. What a great “slip of the tongue”. Hahaha! And I thought the day couldn’t get any better. Wrong. Now that the D word is out there, as in “Dictator Tyrant,” it shouldn’t be long for the Distasteful Terror to adopt it for his own. He probably ordered the faux pas to be made. That will get his trump-pets to start to accept the word, even though they don’t believe it yet. Most of them won’t even know what it means, but it sounds good, doesn’t it? Almost stately, in fact: Tonight we present to you, your new Dictator of the USA, The Democratic Traitor himself, Donald Jackass Trump! I am considering the purchase of four of these sets…to send to my immediate family members who have given their brains over the dark side! Amazing snippets …. anything to shine the light and the lighten the mood!! Good ones … and I caught the ‘two dictators’ piece!! Priceless …. Excellent……Freudian slip……INDEED!!! And that deck of cards…..send Trumpy one…..but….can he play cards? 😜 Hugs. Thanks! I doubt Trumpy has the ability to concentrate long enough to actually play cards, but it surely is tempting to send him a deck anyway! I just love being a thorn in his side! 😀 Hugs!!! Whoops! They mislabeled tRumpsky. He should be the Joker!